It all started with a four-chair turn on “The Voice” season six in 2014. Christina Grimmie was 19-years-old at the time of her Blind Audition on the NBC singing reality competition show. The coaches that season were Shakira, Adame Levine, Blake Shelton, and Usher. On Friday, June 10, 2015, Grimmie lost her life after being shot during a meet-and-greet after performing as the opening act for “Before You Exit” concert in Orlando, Florida. ‘Voice fans know and love Grimmie as a tremendous talent and loving spirit. Her time on “The Voice” is chronicled below from past Hollywood Junket articles about the show. Christina is 19 years old. She put her first video up on YouTube at age fifteen. She said she currently has two million subscribers on YouTube. Adam said that he chose Christina because he’s not sure if he’s seen everything that Christina can do. Singing “Counting Stars” by One Republic. After the battle, Adam said, “I have to go with Christina because she is more prime and ready.” He said Sam had some vocal mistakes. Christina got all four chairs to turn in her Blind Audition and was making YouTube videos before going onto “The Voice”. Blake said she is like a stick of dynamite, but needs to woe. Coach Adam reacted, “This song was an excellent choice. I would have never thought of that (song). Here we are seeing the person we’ve been waiting to see.” He said she is “getting the mastery” of what she does under control. In her last performance, Adam said he’s been waiting for Christina to blossom for a while. Finally she’s arrived. She chose to take-on the Katy Perry song called “Dark Horse”. This song paints the picture of how she wants to paint her real life. She said “Dark Horse” combines her love for Pop, electronic and R&B perfectly. “Hold On, We’re Going Home” by Drake is the song Adam gave her. “I want her to pick a unique song that no one else would pick and do it in a different way” said Adam. Nash said she’ll be able to convince people that she wrote it herself. “I’m amazed at the range, control and depth of her voice. At twenty years old, that’s insane” said Nash. Christina was sad that her two best friends – Tess Boyer and Bria Kelly went home last week. She said she wanted to top her performance last week, and she scored with her rendition of a Lil Wayne song. Adam said no one has ever heard Lil Wayne sound like that! Adam told Christina, “The thing that people love about you is you go above and beyond to be unique and stand out. You are not taking the safe route here. You’re fearless.” He picked the song “Hide and Seek” for her to sing. Christina said about the song “It’s a huge risk doing this. But it’s going to take America by surprise. The chorus in this song it just punches you in the face”. She said if she’s off in the chorus, it’s going to fall flat. She said this song is the biggest risk that she’s ever taken and hopes that it will pay off. Christina pays a tribute to her home town Marlton New Jersey. She said it’s a family-oriented town. When she was ten years old, she got a keyboard which changed her life. Her mom moved to California to support Christina’s dream of singing. She said she heard that her old high school is playing her songs in the hall ways! During her performance, a large amount of balloons were released onto the stage. Carson Daly said “the coaches have NEVER seen balloons before apparently,” as the camera pans over to them having a balloon fight! 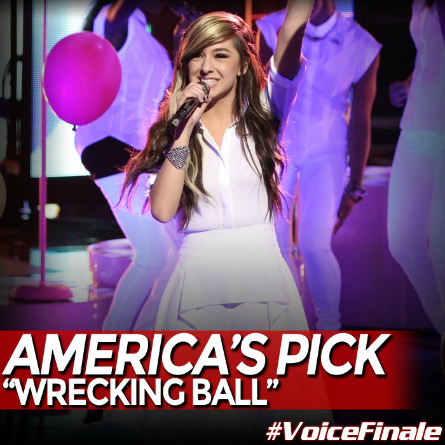 America’s Pick: “Wrecking Ball” by Miley Cyrus. The winner of season 6 of “The Voice” was Josh Kaufman. 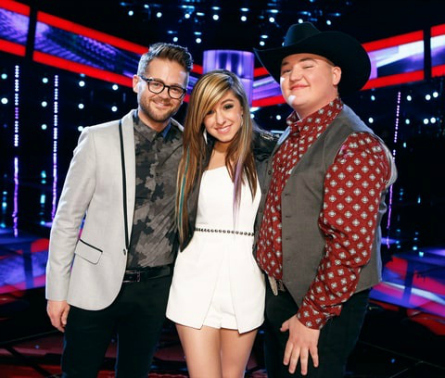 Runners-up were Jake Worthington, and Christina Grimmie. 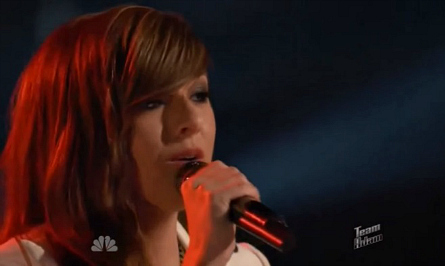 Team Adam’s Christina Grimmie from season six returned to open the show. Grimmie announced that she will be going on tour very soon and has been busy writing. Watch out for some new material soon from her.